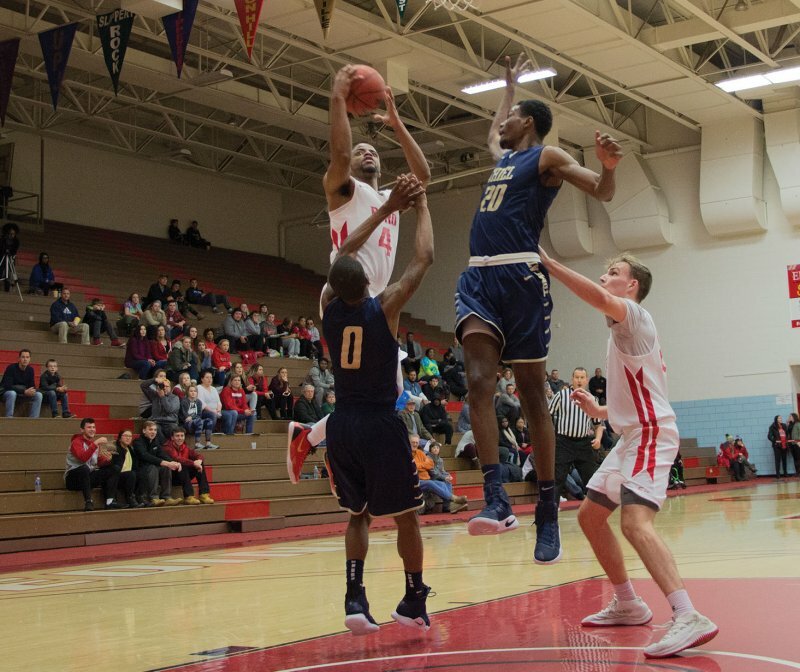 The Edinboro men’s basketball team has added one win and two losses since winning their home opener at McComb Fieldhouse on Nov 10. The team traveled on Nov. 17 to Lake Erie College to face the Storm. They would fall for the first time this season. Lake Erie would begin “the storm” as they put up the first 6 points of the game before Edinboro could score. Edinboro would actually not score until over 2 minutes into the game when senior Anthony Coleman put up a jumper with 17:33 left on the clock. Going into halftime, Lake Erie led with a score of 35-25. On Nov. 10, when this team made their 2018-19 season debut, Edinboro’s football team had just wrapped up their season earlier that day. As football has now officially concluded, All-PSAC second team offensive lineman Trey Staunch hung up his cleats and made his season debut for the basketball team at Lake Erie. Staunch had the team high in scoring in the game with 14 points, while Coleman and sophomore Jaryn Simpson both had 11 points and DeAnthony Owens put up 8. Despite three of Boro’s scorers being in the double digits at the end of the game, the score sat at 74-60 and Lake Erie took the win. With this game the Fighting Scots record moved to 1-1 overall. As Thanksgiving break started up Tuesday, the team returned to McComb Fieldhouse to slam home a win against Penn State - Shenango. After this 87-56 trouncing, Edinboro sat at 2-1 overall. Edinboro got off to a quick start and led 22-8 through the first 7 minutes of the game, with points from Simpson, Coleman, Owens and Daylon Harris. Staunch and freshman Turner Kurt soon had points on the board, and with 5 seconds left on the clock before halftime, Coleman sunk a 3-pointer that put Edinboro at a 43-23 advantage. Coming back from the half, the Nittany Lions would start to close the gap early, but after a foul on Anthony Bailey Jr. put Owens at the line for two shots, Edinboro began to widen the lead once more, growing to over 30 points ahead at one point. At the end of it, Edinboro had a total of 87 points, 50 rebounds and had four players who scored in the double digits. “[I] feel like it motivates us to get back into it, and after a loss it just motivates us to get back into it for the game on Sunday,” explained Coleman. Coleman led in points for ‘Boro in this game with 18. Owens and Staunch both had 14 points and Kurt had 12. Nine of Edinboro’s 50 rebounds were grabbed by Kurt, and Staunch and fellow senior Jack Frank both had seven of their own boards. After gaining the win in this game, Edinboro improved to 2-1 overall. As many students faced the thought of returning to school on Monday, the Fighting Scots boarded a bus Saturday for their journey down to Charleston, West Virginia to face the University of Charleston Sunday, where the team would suffer their second loss of the season with the final score standing at 79-61. This matchup was a game to watch, as the energy of the players grew throughout the game and didn’t fall once it was raised. Edinboro won the tip-off and gained the lead quickly as Coleman put up an early 3-pointer in the first 20 seconds of the game. With 9:59 left in the first half, Simpson stole the ball and got it to Staunch who put 2 points on the board, closing what was now a deficit at 25-17. Less than a minute later, Simpson would narrow the gap with a 3-pointer, bringing the score to 25-20. After an action packed last 3 minutes of the first half, the score sat at 43-26, with the Fighting Scots still trailing. Drew Rackley of the Golden Eagles opened scoring in the second half to begin the opponent’s run of points. After Simpson scored Edinboro’s first points of the second, the score was at 51-28. Charleston quickly responded with a jumper, but seconds later Simpson would sink a 3-pointer. With the score sitting at 66-53 going into the last 6 minutes of the game, Edinboro missed several 3-point shots in a row. Staunch and Freeman put up a combined 6 points for Edinboro in the last 2 minutes of the game to bring the final score to 79-61. Simpson led in points in this game with 20. He led in free throws and in 3-point shots. Staunch followed behind with a total of 12 points, Owens with 8 and Coleman with 7 points, rounding out Edinboro’s top scorers. Kurt added 2 points to his young career total, giving him 27 through the team’s first four games of the season. 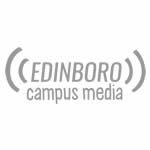 The team will next play away on a game-filled weekend as both the Edinboro men’s and women’s teams will face off against West Chester and Bloomsburg, Saturday and Sunday.